Research in Motion may have previewed their BlackBerry 10 OS earlier this year, but there's been little information about what the first BB10 smartphone will be. 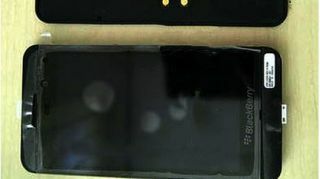 However, new images of the first potential BlackBerry 10 smartphone have leaked, giving us a better glimpse into what RIM has planned for 2013. Codenamed London, the phone appears to look very similar to the alpha hardware shown off when RIM was demonstrating BB10 this past summer. Though the leaked images don't reveal much about RIM's rumored phone, the touchscreen would lend credence to earlier reports the first BB10 smartphone wouldn't use a keyboard. Not much else is known about the purported device as of yet, but we do know it will come with a 4.2-inch screen size and the 1280x768 resolution, as well as front and rear cameras. Earlier this year, it was believed RIM was only working on one BlackBerry 10 phone, meaning the London could be the sole BB10 device released in 2013. RIM is set to host the BlackBerry Jam Americas next week, and we may get a better look at their first anticipated BlackBerry 10 smartphone there.